50 / the tasting panel / october 2017 WINE TECH F ew possessions exude a sense of unbridled possibility more than a passport, and an emerging lifestyle brand is bringing that concept to the wine world. The aptly-named Fermented Lifestyle—an online resource that connects wine lovers with exclusive deals and luxury experiences—launched this summer and already has partnerships with about 60 wineries in 16 countries. Fermented Lifestyle CEO Kristina Steward, who launched the corporation with Executive Chairman Mark Norman (The Tasting Panel's Publisher and Editorial Director Meridith May serves on the board of directors), says it's a direct response to the "explosive growth" of interest in small-production, handcrafted wines that's helped drive a steady increase in direct-to-consumer sales. 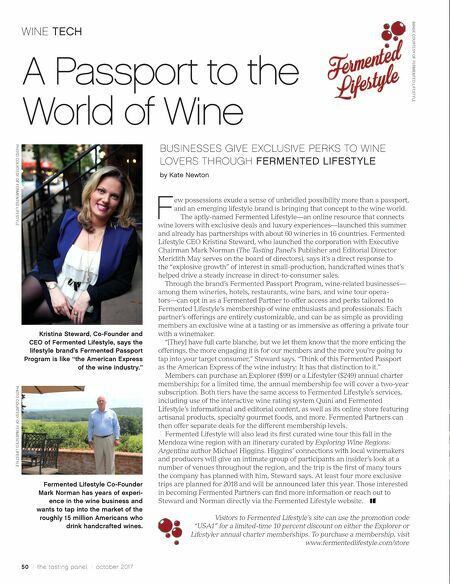 Through the brand's Fermented Passport Program, wine-related businesses— among them wineries, hotels, restaurants, wine bars, and wine tour opera- tors—can opt in as a Fermented Partner to offer access and perks tailored to Fermented Lifestyle's membership of wine enthusiasts and professionals. Each partner's offerings are entirely customizable, and can be as simple as providing members an exclusive wine at a tasting or as immersive as offering a private tour with a winemaker. "[They] have full carte blanche, but we let them know that the more enticing the offerings, the more engaging it is for our members and the more you're going to tap into your target consumer," Steward says. "Think of this Fermented Passport as the American Express of the wine industry: It has that distinction to it." Members can purchase an Explorer ($99) or a Lifestyler ($249) annual charter membership; for a limited time, the annual membership fee will cover a two-year subscription. Both tiers have the same access to Fermented Lifestyle's services, including use of the interactive wine rating system Quini and Fermented Lifestyle's informational and editorial content, as well as its online store featuring artisanal products, specialty gourmet foods, and more. Fermented Partners can then offer separate deals for the different membership levels. Fermented Lifestyle will also lead its first curated wine tour this fall in the Mendoza wine region with an itinerary curated by Exploring Wine Regions: Argentina author Michael Higgins. Higgins' connections with local winemakers and producers will give an intimate group of participants an insider's look at a number of venues throughout the region, and the trip is the first of many tours the company has planned with him, Steward says. At least four more exclusive trips are planned for 2018 and will be announced later this year. Those interested in becoming Fermented Partners can find more information or reach out to Steward and Norman directly via the Fermented Lifestyle website. Visitors to Fermented Lifestyle's site can use the promotion code "USA1" for a limited-time 10 percent discount on either the Explorer or Lifestyler annual charter memberships. To purchase a membership, visit www.fermentedlifestyle.com/store A Passport to the World of Wine BUSINESSES GIVE EXCLUSIVE PERKS TO WINE LOVERS THROUGH FERMENTED LIFESTYLE by Kate Newton IMAGE COURTESY OF FERMENTED LIFESTYLE PHOTO COURTESY OF FERMENTED LIFESTYLE PHOTO COURTESY OF FERMENTED LIFESTYLE Kristina Steward, Co-Founder and CEO of Fermented Lifestyle, says the lifestyle brand's Fermented Passport Program is like "the American Express of the wine industry." Fermented Lifestyle Co-Founder Mark Norman has years of experi- ence in the wine business and wants to tap into the market of the roughly 15 million Americans who drink handcrafted wines.